Senior Nick Corvino plants his foot mid-dribble while preparing to drive against a defender. As a team captain his versatility on both the inside and out helped South Pasadena navigate momentum swings in its 57-53 victory over Monrovia The win evens the team’s record at 1-1 in league play. Following a rocky first half, boys’ basketball overwhelmed Monrovia in the third quarter and ultimately emerged victorious 57-53 on Friday night. 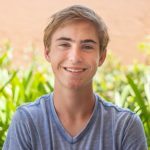 Halftime adjustments brought a zone defense and a renewed sense of urgency, which resulted in the Tigers trouncing the Wildcats 18-5 in the third period. 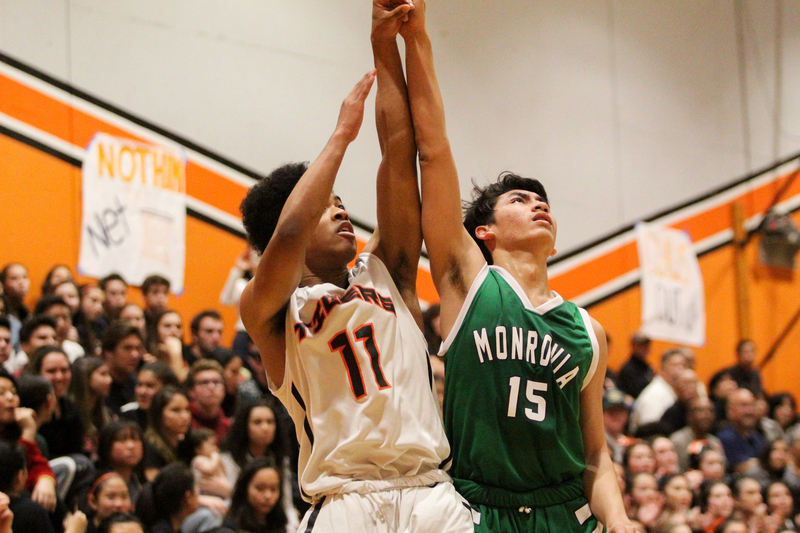 Monrovia mounted a comeback, but clutch plays cemented South Pas as the victor in the dying moments. The win brings the Tigers’ overall record to 9-10, and levels their league record at 1-1. Senior Jaylen Park makes an appearance in the starting lineup. South Pas and Monrovia opened the game with heightened offensive presence, with both teams knocking down three-pointers on the perimeter and cutting to and finishing at the rim. As the period progressed, the Wildcats continued to display offensive prowess while the Tigers failed to maintain their offensive rhythm. On defense, Monrovia worked as a cohesive unit to clog lanes and collapse on driving Tigers, and responded quickly on the attack to prevent South Pas from eliminating their lead. The Wildcats skillfully evaded the Tigers’ suffocating defense, consistently finding the open man, who either pulled up for a mid-range jumper or settled for a triple. Senior Jaylen Park managed to cut the deficit to 27-24 with a corner three, but Monrovia drilled the exact same shot seconds afterward, extending its ead once again. Fortunately, senior forward Ben Kent nailed a significant three in the final minute of the first half, bringing the score to 33-29 before the fifteen-minute intermission. Junior Sebastian Au-Rivera attacks the basket in the second quarter. Senior phenom Nick Corvino wasted no time making his presence known in the third quarter, swishing a deuce and a three to provide South Pas with its first lead (35-34) since the opening minutes of the first period. 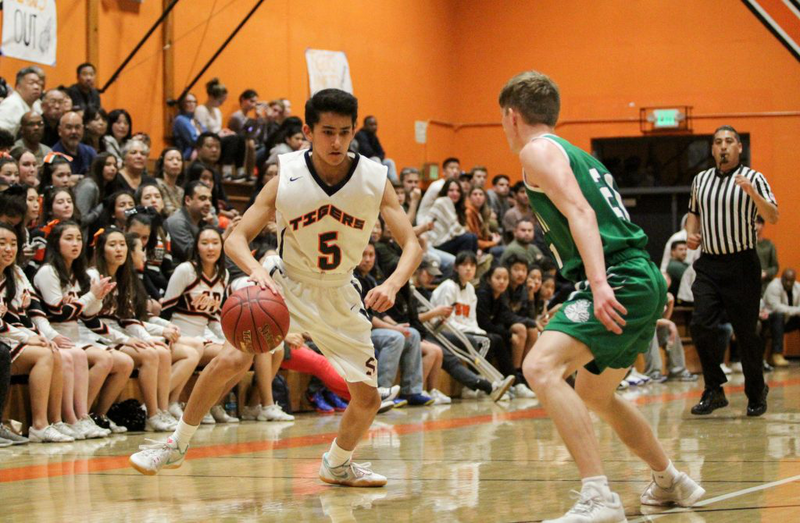 The Tigers used lengthy passes in transition to stretch the Wildcat defense, as senior Noah Uemura launched a half-court pass to Corvino, who banked the ball off the glass to increase South Pas’ advantage. Meanwhile, the Tigers neutralized the Monrovia attack with a zone coverage, utilizing their superior speed to block lanes and force contested shots. Kent and Corvino capitalized on Monrovia’s struggles, expanding the Tigers’ lead to 47-38 with additional threes before the end of the third quarter. Senior Noah Uemura shoots a highly contested jump shot. South Pas resumed its phenomenal performance from the third period in the first moments of the final quarter. 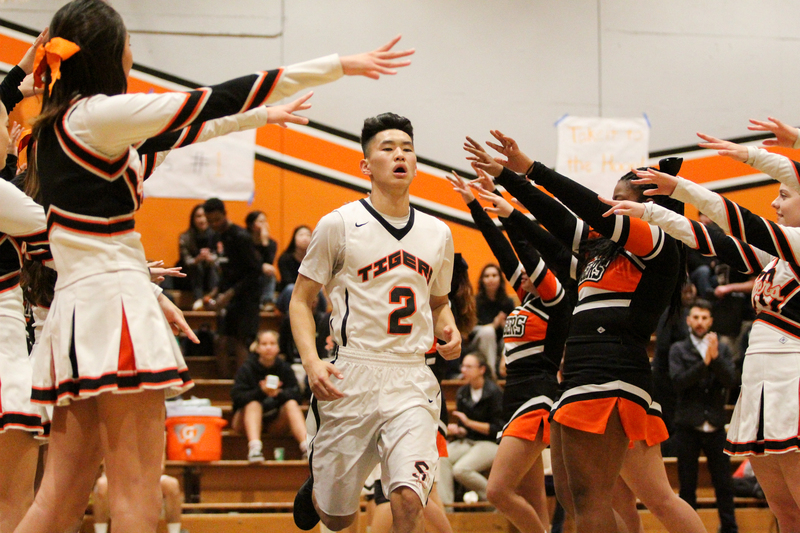 Juniors Sebastian Au-Rivera and Ryan Chuang knocked down three-pointers, igniting the home crowd. Unfortunately, the Tigers began to lose their grip on the game and Monrovia slowly but surely reduced South Pas’ lead, prompting an anxious timeout from coach Ryan Lee due to a 53-50 score with 1:30 remaining. Following two traveling calls on the Tigers, the Wildcats drilled a three to tie the game. The gravity of the ensuing possession amplified immediately. Fortunately, junior Matthew Mayemura executed under pressure, getting in behind the Monrovia defense and scoring a paramount layup with under a minute left. South Pas tightened its coverage on the subsequent Wildcat opportunity, securing a rebound and forcing Monrovia to foul to have a chance of victory. 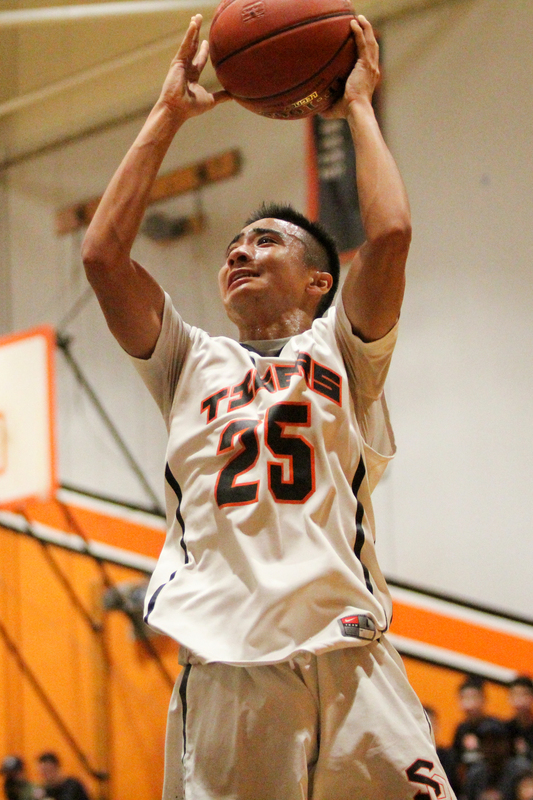 Senior Danny Rios knocked down both free throws effortlessly, putting the game out of reach with the 57-53 score. Boys’ basketball will travel to Temple City on Wednesday, January 17, at 7:00pm.